Welcome to a time machine called The Secret Sisters. The music on You Don't Own Me Anymore has nothing to do with 2018, even less with 1991, let alone 1967. In short to truly compare this music to anything I have to go back to days from before I was born. To before when rock and roll broke big. The days of singers I heard in the few shows I was able to hear, compiled by Bob Dylan in his now legendary 'Theme Time Hour' show. In other words, I do not really have any comparisons. Just faint ideas on something that might have been, long ago and far away from the country I grew up in. The Secret Sisters are two sisters called Rogers, Lydia and Laura. Two sisters who can sing fabulously together, write some interesting songs and great stories, yet nearly were lost for music after being dropped by their record label after the under achieving second album 'Put Your Needle Down'. A story of hardship known to most artists of all times. From the hardships The Secret Sisters come forward with a beautiful record, with a title that seems like a sneer in the direction of the former label owners and their minions. 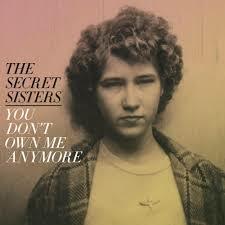 Under the direction of Brandi Carlile The Secret Sisters come up with a record that has a beautiful clear sound with the two voices firm in the middle of all the embellishments Carlile makes others play. Something that has been done a million times before for country, singer-songwriters and alt.Americana artists, yet when done right and with the love for detail each song deserves, it never fails to impress me. These details can vary. A banjo and a honky tonk piano carry one song ('King Cotton') in another it can be a French horn blowing away softly in the background ('Carry Me'). Instantly the mood of the record is changed, giving it a well appreciated variation. No matter what happens, there's one constant: the two voices of the sisters Rodgers. Their voices mingle through or support each other or both do lead together. The one slightly higher than the other. No matter what, they always just sound right. There is a little downturn I want to mention. Everything is extremely nice and kind. There's not a single (musical) bombshell to be found on You Don't Own Me Anymore. This does make the album somewhat one dimensional. I would have liked one or two slightly tougher songs on the album, I found. As the overall quality of the album has the upper hand, there is not really a lot to complain, really. Starting the album I got the impression that I was going to listen to an American river per song. The Tennessee in song one, the Mississippi in song two. No river in the third. Some states come by though, so geography must be a hobby of the sisters. The lyrics are not all sunshine and roses. "I took to the hard road". "Brought you in this world and I can take you from it just the same". What is actually said here? To kill the baby girl the storyteller got far too early in life? Here is the bombshell anyway as far as I'm concerned. "The closer you get, the farther I'm going to run". Just to name a few examples you as listener are about to encounter. Life is hard in the country of America's south, seems to be the story told. Whether then in the 50s or now in 2018. One of the best Americana songs I've got to know is on this album. 'Mississippi' is such an incredible strong song. Vocally, melodically, harmonically, all seems to fall in its place. It's dark, yet full of a strange sort of love. A song like a sledgehammer to the head. Despite the fact that everything in this song has been done a million times in the past decades, this is all there is. This is the naked essence of a great song. The producers knew it to, as they have done everything to lift it up where they could. Just tune in to the little details to find out how. 'Mississippi' is simply, stunningly glorious. With Kathy's Song by Simon & Garfunkel the album knows one cover song. The intro's guitar playing instantly recognisable as Paul Simon's fingerpicking style guitar playing. It one of the less exuberant songs on this album. The Secret Sisters have to hold back seriously to sing this song. 'I Am A Rock' may have fitted them better it seems. You Don't Own Me Anymore may be a time machine. Yet no record from the 50s could have sounded like this album does. It is just so fine. In January we reviewed 'Go Get Gone' by Worry Dolls. This record actually comes very close to that record. It seems The Secret Sisters have put themselves back on track, no matter how hard it is to be a self-supporting artist in these days of Spotify and endless copying. Quality ought to surface and blossom. So here's to that and The Secret Sisters. The Secret Sisters will tour this country in the first days of April. Go and find out where! It will be worth your while is my best guess.